Some external terrorists from outside Sajek have set these fires. There is no conflict between Bengalis and Paharis in this area. Those who set the fire don’t want the current communal harmony between Bengalis and Paharis to stay intact. Since they want to create a terrorist center in this area, they try to keep both sides agitated. BY NEARLY all accounts, Bengali settlement in the Chittagong Hill Tracts has accelerated. It has intensified. Why? Discovering the truth is never an easy task. More so, in times of Emergency. But our rulers forget, not everyone submits. ‘A happy slave is the biggest threat to freedom,’ says a postcard on my wall. Fortunately, the peoples of this land, neither Bengalis nor adivasis, have submitted. Never fully. Or, for long. Five victims of Sajek – Pahari villagers – have come forward. They spoke out at a press conference in Dhaka, on April 27, 2008. Two separate fact-finding committees, consisting of writers, teachers, lawyers, student leaders and activists, human rights activists, left leaders, journalists, women’s group activists, visited the affected villages in Sajek, Rangamati. They spoke to Paharis and Bengalis. To settlers and civilians, to army personnel. They spoke to Paharis who had sought refuge in temples and forests after the arson attacks of April 20. Some still sleeping under open skies. They spoke to settler Bengalis too. To those who had taken refuge in the local market. To another settler, who had sought and found refuge in the nearby army camp itself. Those in the market were also being looked after by the army. Bengali settler houses, Dui Tila, Sajek union. ©Udisa Islam, 27 April 2008. Binoy Chakma, a Pahari victim, had said at the press conference, nearly ninety per cent of the villagers of Purbo Para, Gongaram Mukh, Retkaba, Baibacchora, the four Pahari villages that were burnt down, originally belonged to Longodu, Borkol, and Dighinala. But we were forced to leave our homes, said Binoy, because of army and settler attacks. Life in Baghaicchori, under Sajek union, was not easy. Army presence was continuous. It was stifling. But we managed. We managed to lead peaceful lives, to eke out modest livings. Things changed, however, with the declaration of Emergency, said Binoy. Warrant Officer Haroon told us, army posts will be built here. But later, small huts were built instead, in our land and garden. The settlers built them, the army helped them. We had set aside land for building a Buddhist temple, they took that away too. We protested, but they threatened us. Indra Chakma’s pineapple garden in Retkaba was destroyed. Ali, a settler, forcibly built a house on Indra’s land. Indra resisted, Ali and the soldiers dragged him to the army camp. If you protest again, they said, we’ll slaughter you like a sacrificial cow. There were other injustices, too. Rat infestation had left us with little food, the UNDP gave rice for 1,500 families. It was the UP Chairman L Thangar’s duty to distribute 20 kilograms for each family. But he gave only 8-10 kilograms to each Pahari family. When we asked him, he said, he had army instructions. Between 1979 and 1983, Bangladesh’s military rulers sponsored migration of Bengali settlers into the Chittagong Hill Tracts. An estimated 500,000 plains settlers were provided land grants, cash and rations. As is clear from the Chittagong Hill Tracts Commission report, Life is not ours (1991), the programme of turning Paharis into a minority was not made public then. Government representatives had repeatedly denied the existence of such a plan. What does one hear now? Bengali settlement in the CHT is a thing of the past. The 1980s, yes, that was the settlement era. It was a mistake. The military rulers failed to realise it was a political problem, it should not be dealt with by force. Things are very different now. Now you may find some Bengalis going to CHT, they are following their family members. That is not settlement. How can one stop that? It sounds nice, the only problem is that it isn’t true. Settlement is still active. It seems to be at a final stage. Ina Hume, a daughter of the hills, and a careful observer of military repression wrote in 2005, a new road has been built from Baghaihat to Sajek. It borders the Mizoram hills of northeast India. She adds, there have been reports that the Bangladesh Army is involved in settling a further 10,000 Bengali families in the Kassalong Reserve Forest in Sajek. The writers of Life is not ours had noted, Pakistan, and later, the Bangladesh government had been uneasy about the borders with India and Burma being inhabited by a majority of the hill peoples. The Sajek incident, it seems, was destined to occur. Need I say that the proposed settlement of Bengali families in the Kassalong Reserve Forest is in direct negation of the 1997 Peace Accord? Or, that the construction of the Baghaihat-Sajek road by the Bangladesh Army Engineer Construction Battalion, in the Kassalong Reserve Forest, clearly violates the Forest Act of 1927, and the Bangladesh Forest (Amendment) Act, 2000? Most media reports in the Bangladesh press have stressed that losses occurred on both sides. Most reports mentioned that a larger number of Bengali homes were razed to the ground. The other committee report, the one led by Moshrefa Mishu, is also invaluable. It fleshes out what the Bengalis settlers lost. According to the writers, Bengali settler houses are temporary shelters. They consist of four stakes (khuti) pegged to the ground. There are hundreds of such homes in the Dui Tila area. They write, we spoke to Bengali inhabitants, who told us that they live here for short periods only. The report says, land grants to Bengali families are parcelled into smaller pieces meant for habitation, close to army camps, and larger pieces, located in far-away places. The report states, ‘…most Bengalis have two houses… Dighinala and Lichu Bagan are 12 kilometres apart…We interviewed settlers who told us that they had received 4 acres and 1/70th land in Lichubagan, and the remaining 1/30th land on Betcchari.’ The writers go on, it was the same in Dui Tila and Chongracchori. Settlers told us, they had 1/30th of an acre here, the rest, 4 acres and 1/70th land in distant mountainous areas. Communal harmony: a myth in the making? 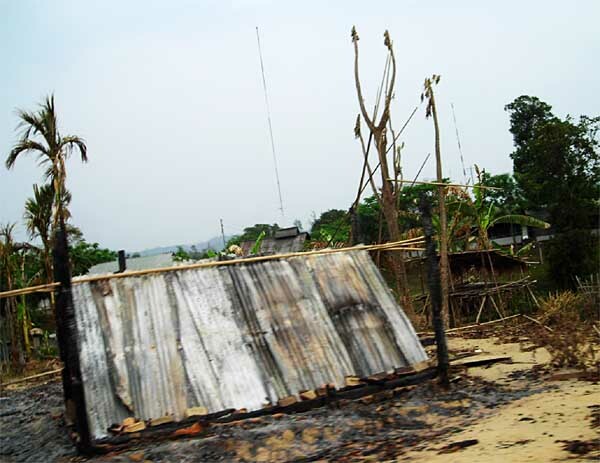 After the Sajek incident, both high military officials in Dhaka, and those lower in the rung, in the Hill Tracts, like the Major quoted above, have spoken of the communal harmony that exists in the Hill Tracts, that incidents like the Sajek arson attack threaten. These will not be tolerated, we have been told. A group of “external terrorists,” described by some as “unidentified terrorists,” is out to destroy peace and development efforts in the Chittagong Hill Tracts. The army has affirmed that such incidents will not be tolerated, that peace and communal harmony must be maintained at all costs. Such affirmations ignore history. It makes nothing of tales of killingsperpetrated by Bengali settlers and security forces. To mention some: Logang cluster village massacre, Khagracchori 10 April 1992. Naniarchar Bazar massacre, Rangamati, 17 November 1993. Malya massacre, Langadu upazilla, 1992. It ignores instances of communal riots such as the Bhuacchari incident, April-May 2003. Other Sajeks will occur, I guess, if we do not face up to the truth. Even in times of emergency. Well said! A timely article speaking truth to power! “External terrorists” are breeding fast. Everywhere. Not just in Iraq, Afghanistan, but lately in India too. Fecundity matches ferocity. Another remarkable aspect of this global phenomenon is its continual discovery and exposure by the external invader, the alien aggressor, the foreign warmonger. In short, the oppressor, the violator. This “intelligence” enterprise is flourishing. It sacralizes the arbitrarily presumed and peremptory righteousness of the voluminous violence, the mega terror (war, massacre,ethnic cleansing. And it anathematizes resistance to the tower of tyranny and its shower of terror. Let me limit myself to India. Anyone in lungi, speaking Bangla,and bearing a Muslim name, is, to the babudom, both an illegal immigrant, and a terrorist. Unless he proves otherwise, and in English. Not many can pass the test which is meant to intimidate and coerce. The police, to prove its efficiency, will net innocents. It brings rewards from the state. It also helps the muckamucks wallow in lethargy and incompetence, sparing them the exertion to trace and track real illegals, real terrorists. “super democracy”, the “indispensable nation”.